Can I catch anything from Bed Bugs? Around 49 different pathogens have been found in bed bugs, none have yet been recorded as being passed on to humans. It is understood that bed bugs are only putting their saliva into us, unlike other pests. 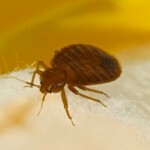 The main health issues associated with bed bugs are infections caused by scratching bites, anxiety and sleep-related disorders.